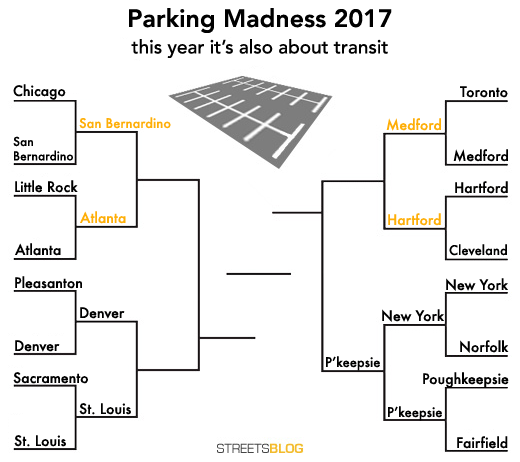 We have our first member of this year’s Parking Madness Final Four, as readers vote to determine which North American transit station is drowning in the most shameful sea of parking. Poughkeepsie’s commuter rail station knocked out the stadium parking lots by the 7 train in Willets Point, Queens earlier this week. There are still three spots up for grabs. If you didn’t vote in the Atlanta vs. San Bernardino contest yesterday, we fixed a bug with our poll plug-in and everything is working again — go vote. 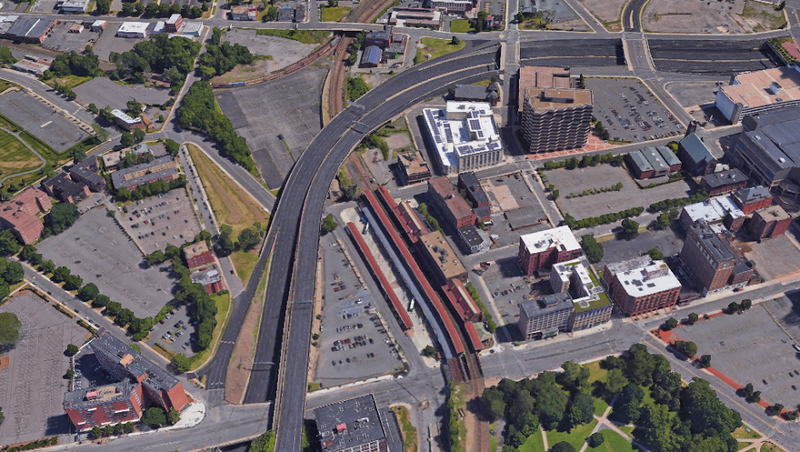 In today’s match, Hartford’s central transit hub takes on a T station just outside Boston. First up is Hartford’s Union Station, which beat the “Muni Lot” RTA stop in Cleveland in the last round of competition. Reader Mike Crimmins was one of three people who sent in nominations for this station. Hartford’s main transit hub, Union Station, is located directly in the center of the picture above and currently serves as an Amtrak and CTFastrak bus rapid transit station, with commuter rail service running from Springfield, MA to Hartford to New Haven, CT expected to begin operating sometime next year. As you can see, there is currently a huge amount of parking around Union Station, isolating it from many offices and business just a few blocks away. Parking constitutes around 20% of Hartford’s total land use, so this doesn’t come as much of a surprise. Interstate 84 runs through the city and passes close by the station as well. Efforts to reduce the impact of the freeway on the city and to repurpose some of the excessive amount of parking are underway, although it will likely take decades for the city to fully recover. Wellington T Station in [Medford], MA just north of Boston. The station is sandwiched between a massive parking lot, a major highway and a train maintenance yard. There is also a parking garage just west of the station. I am not sure how any one from the neighborhoods north get to this station on foot/bike, and it is really too bad that using/being near the Malden and Mystic Rivers is almost impossible here. I live in Medford, and cycle past that area every day, so I can provide some insight. 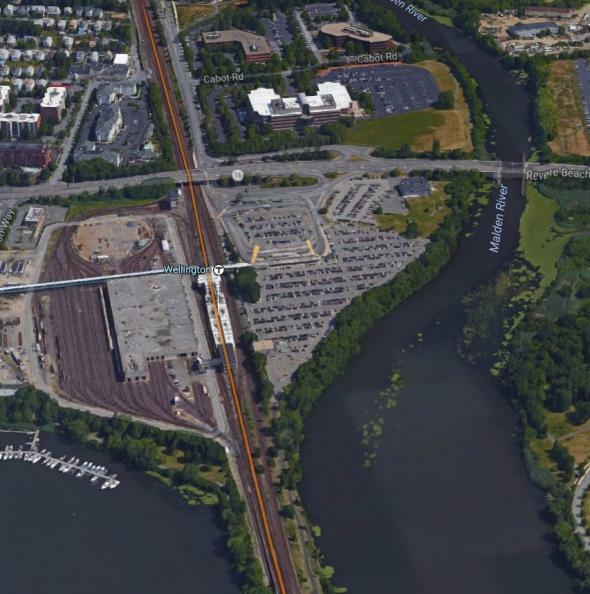 The bike trails on both sides of the Mystic River are quite useful, and there are even to bicycle cloverleafs connecting the paths to the Route 28 bridge and to Route 16’s sidewalks, so one can dodge that nasty traffic light where the two meet. That serves people who live north-west of the area. it’s not so good for anyone living directly north of there. Hartford is worse, it the center of the city. If that’s your downtown, then the whole town is just one giant parking crater. As for Medford… Wellington was built on a low-lying brownfield, subject to sea-level rise, specifically as a transfer point from automobile to the T. This is not a great place to build housing. Would it be better if they’d just left it as abandoned warehouses and built no station at all in that location? The T has a number of auto-commuter stations; and it also has plenty of stations that function as downtown / TOD hubs. Is there anything wrong with having a mix? You cannot compare a suburban commuter train lot to a downtown train lot. It’s apples to oranges, this vote makes no sense. Depending on your planning priorities, the case could be made for either. I heart Parking Madness, but the themes each year need to be tightened up — malls vs malls, stadia vs stadia, suburban commuter vs suburban commuter, urban core vs urban core. “I am not sure how any one from the neighborhoods north get to this station on foot/bike…” I walk to this station every day from the north; it’s congested, but not difficult. I cross Route 16 at a 3-segment crosswalk. Ideal? No. Totally and completely doable? You bet. I’ve done it by car a few times, and I absolutely get there faster when I walk. Medford isn’t that bad, yet it keeps inexplicably winning. This is very frustrating. It is also frustrating that Anaheim’s ARTIC station, in line with this year’s theme, wasn’t included. Streetsblog is on the hunt for the North American transit station that's most severely undermined by excess surface parking, and today you'll meet the last two contestants in the running.